As I discuss in this question, by far the most popular school of Hindu philosophy is the Vedanta school, which bases its tenets on the doctrines laid out in the Brahma Sutras, a work by the sage Vyasa which summarizes and systematizes the philosophical teachings of the Upanishads. (You can read the Brahma Sutras here.) Now as I discuss in this answer, most Vedantic philosophies believe in three Pramanas or means of valid knowledge: Pratyaksha or perception, Anumana or inference, and Shabda or scriptural testimony. Those means of knowledge are six in number, their divisions being perception, inference, comparison, verbal testimony, presumption and non-apprehension. These are, incidentally, the same six Pramanas accepted by the Purva Mimamsa philosopher Kumarila Bhatta and his followers. 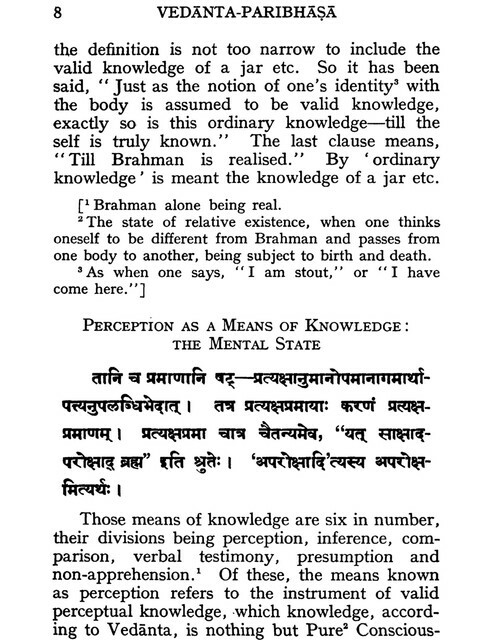 (The Purva Mimamsa philosopher Prabhakara and his followers, in contrast, only believed in five Pramanas.) But my question is, what is the earliest Advaita work that references these six Pramanas? I found out from this forum post that the 13th century Advaita philosopher Chitshuka says in his Tattva Pradipika the following quote: "Vyavahare Bhattanayah", which means that from the relative perspective (the perspective of someone living under Maya) Advaitins agree with Kumarila Bhatta. I'm not sure whether Chitshuka was referring to the number of Pramanas though. In any case, does Adi Shankaracharya reference these six Pramanas in any of his works? What about any of his disciples? Browse other questions tagged philosophy vedanta advaita adi-shankaracharya pramana .